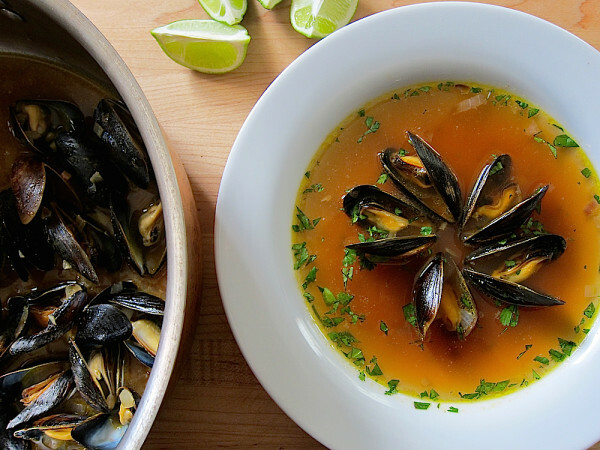 Beat the cold, foggy, and rainy San Francisco summer weather blues with this Peruvian steamed mussels soup — Caldo de Chorros. Start with a simple vegetable stock, then prepare an onion sofrito with garlic, ginger, and spicy aji amarillo. Add a little bit of white wine, steam the mussels, and top off with cilantro and a few drops of lime juice. Serve with bread, pair with a glass of Sauvignon Blanc or Riesling, and you’ll be inviting summer weather back to San Francisco. In addition to the ingredients above, you’ll need 2 pots, one to warm the stock, and one to steam the mussels. Serve the mussels into shallow soup bowls, pour 1 cup of stock over each serving, garnish with parsley and a few drops of lime juice. Be sure to use fresh mussels, and cook them the same day you picked them up from your fishmonger. Discard any mussels that opened before cooking. When steaming the mussels, use only enough stock to create a shallow pool that will boil and produce enough steam to cook the mussels, but is not too deep to cover all of the mussels. Discard any mussels that did not open after steaming.